Western blot analysis of extracts from untreated or PDGF-treated NIH/3T3 cells, pretreated with wortmannin #9951 and/or rapamycin #9904 as indicated, using Phospho-Akt (Ser473) (193H12) Rabbit mAb (upper) or Akt Antibody #9272 (lower). 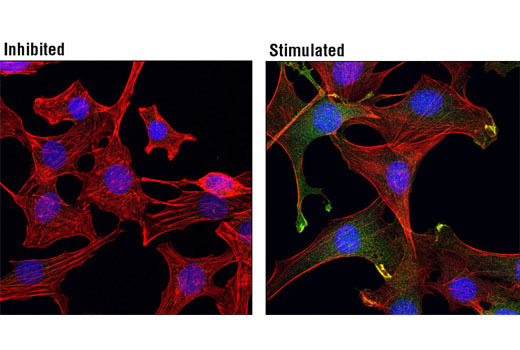 Confocal immunofluorescent analysis of C2C12 cells, U0126/LY294002/Rapamycin-treated (left) or insulin-treated (right) using Phospho-Akt (Ser473) (193H12) Rabbit mAb (green). Actin filaments were labeled with DY-554 Phalloidin (red). Blue pseudocolor = DRAQ5® #4084 (fluorescent DNA dye). 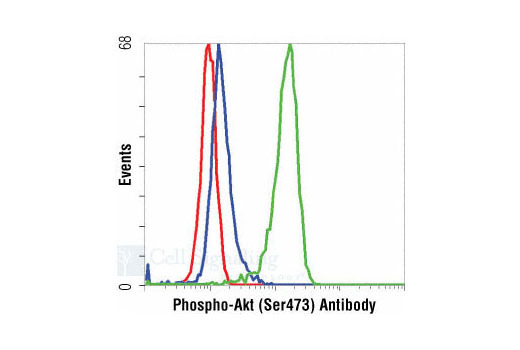 Flow cytometric analysis of Jurkat cells, untreated (green) or LY294002 #9901 and Wortmannin #9951 treated (blue), using Phospho-Akt (Ser473) (193H12) Rabbit mAb compared to a nonspecific negative control antibody (red). 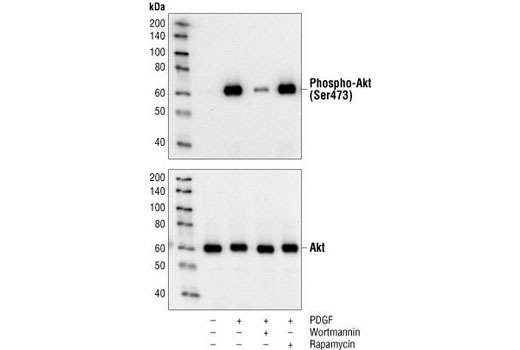 Phospho-Akt (Ser473) (193H12) Rabbit mAb detects endogenous levels of Akt only when phosphorylated at Ser473. Monoclonal antibody is produced by immunizing animals with a synthetic phosphopeptide corresponding to residues around Ser473 of mouse Akt.